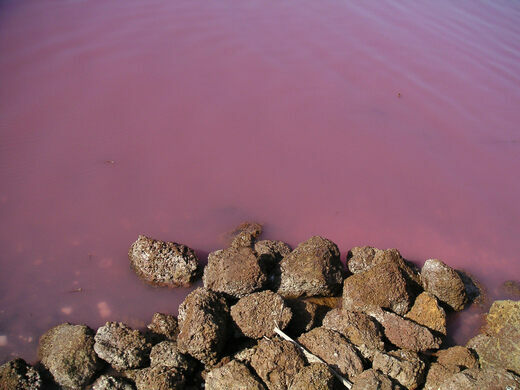 Evoking visions of Candyland fantasies, the princess pink waters of Lake Retba are deceptively inviting. And island made out of shells, including a cemetery. White beaches and sandy dunes call to tourists, film crews, and even play host to the finish line of the Dakar Rally. As tempting as it appears, despite its popularity, and the fact that you will often see people wading through the pink waves, Lake Retba is not the friendliest of waters, and that white sand is mostly salt. 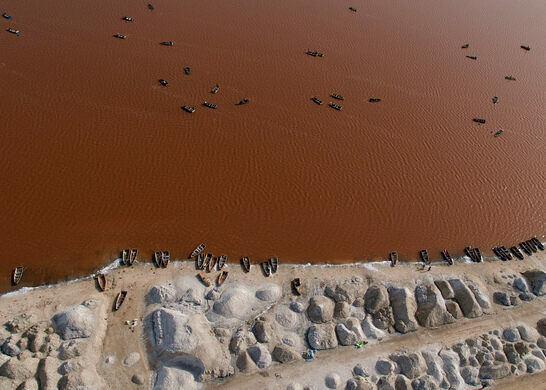 Also known as “Lac Rose,” this unique lake lies just north of the Cap Vert Peninsula of Senegal, northeast of Dakar. Its salt content rivals that of the Dead Sea, which makes for increased human buoyancy, as well as a busy salt industry. Salt collectors arrive daily at the lake, covered in shea butter to protect their skin from the harsh salinity, and spend seven hours a day collecting the precious mineral from the lakebed. The water in Lake Retba constantly changes hues, but the most stunning pink shade appears during the dry season. During windy weather and during the short wet season, the lake’s colour is not strikingly pink due to the rain, which dilutes the salinity. The salt-loving micro-organism Dunaliella salina, combined with high a mineral concentration and the intensity of the summer sun, are the producers of the cotton candy-colored water. With the salt levels reaching up to 40%, the lake can sometimes take a more sinister shade, appearing blood red, a much less comforting place for your imagination to go when gazing out upon the surreal view. The lake is 40 km north of Senegal's capital, Dakar. With a car, the ride will take you less than one hour.